As part of the Kendal Food Festival, the Aga shop is hosting a bring and bake competition. I’ve never been in a food competition before but decided to give it a go. 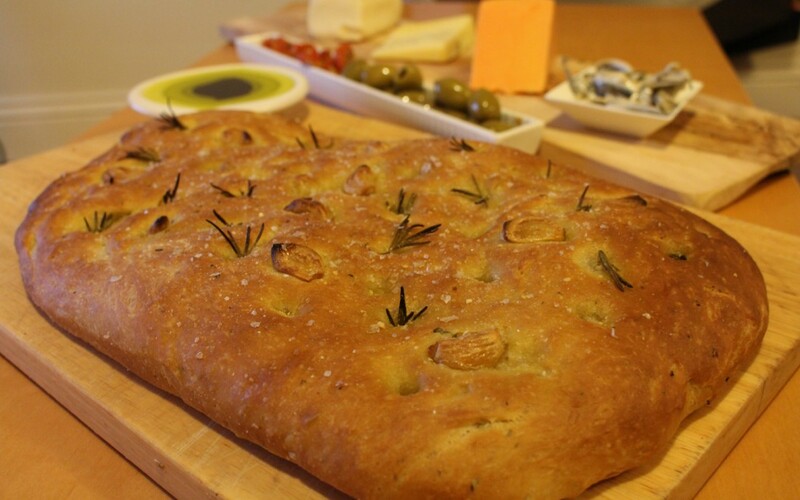 As I live so close to the shop I though my recipe for roasted garlic and rosemary focaccia would be perfect as it will be still warm when I deliver it and focaccia always best served warm. Mix the flour, salt and chopped rosemary in a large bowl, then stir in the yeast. Mix in 4 tbsp of olive oil into the dry ingredients so full combined. Gradually stir in the water you might not need all of it, but you are looking for a wet dough. Tip out on a lightly floured surface and need for 2 mintutes. the dough should be still very wet. Place in a oiled bowl and cover with cling film or place in a pastic bag in a warm place. Leave for 2 hours until the dough has doubled in size. Meanwhile you can roast the garlic. Set the oven to 180C and wrap the garlic bulb in tin foil with a drizzle of olive oil and some salt and pepper. Roast the garlic for between 15-25 minutes depending on size of the bulb. When ready the cloves should have started to become soft and slightly translucent. Remove the cloves from the skins and set aside. After the 2 hours are done empty the dough on to your working surface and knock back the dough (basically punch the air out) need for another minute and shape into a rectangle shape about a 1cm thick and place on the oiled baking tray. Leave to prove for another hour. After an hour the dough should have puffed up again. Mix the remaining 2 tbsp of oil with a drizzle of water in a bowl. Dip your fingers in the mix and press into the dough to create the classic focaccia dimples all over the dough. Drizzle the remaining oil and water mix over the dough. Take in the garlic cloves and add randomly on top of the dough pressing in lightly, then place the rosemary sprigs into the dimples. Finally sprinkle the salt on top of dough leaving some for after the loaf has cooked. Place in the oven for 20 minutes until turning brown then take it out and leave to cool slightly. Serve with good olive oil and balsamic vinegar.